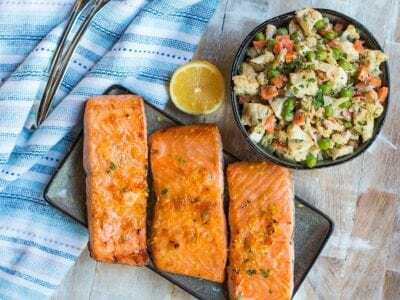 This meal prep for lunch features brown sugar glazed broiled salmon and a veggie loaded roasted cauliflower salad. The perfect cold lunch meal prep for work and school. The most common request I get on the FlavCity YouTube channel is for lunch recipes that can be taken to work or school. Not everyone has the ability to warm their food up. Well luckily this lunch meal prep recipe can be eaten cold and is full of flavor. This meal prep lunch recipe makes 5 servings. Just make sure to read the storage info below the recipe regarding the salmon. I first made this recipe on the grill with a cedar plank. 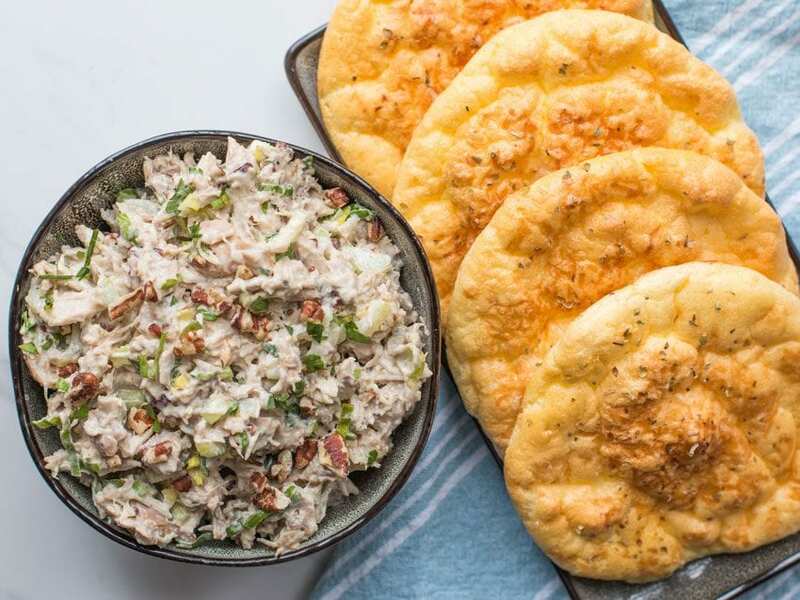 It is the most perfect summer dish and easy to feed a crowd with. But during the winter, it’s not so ideal to fire up the grill, so I adapted it for the broiler. The broiler is basically and upside down grill, so it works perfectly and much quicker than on the cedar plank. Big score! Make sure to check out my other salmon recipes. 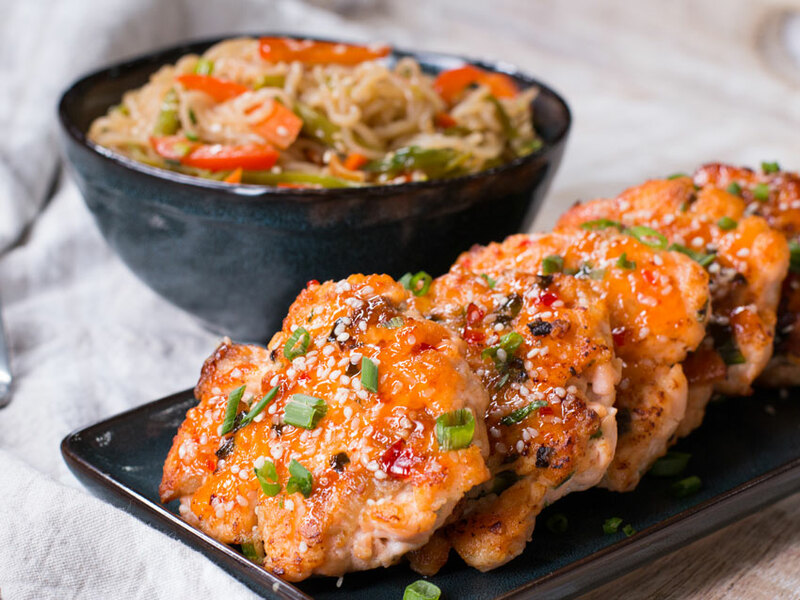 Like this Asian salmon patty meal prep and 3 ways to cook salmon. This salmon glaze recipe has only a few ingredients: orange zest, lemon zest, brown sugar, and salt. If you want to use coconut sugar, that works too. You can even make it keto by using a brown sugar substitute. Once you apply the glaze ingredients, just allow the salmon to sit in the fridge for about 30 minutes so the glaze can form. The salt draws moisture to the surface, melts the sugar, and forms the most delish salmon glaze. I like to broil the salmon on low for 5 minutes and then switch it to high so the top of the salmon gets bubbly and dark. It’s like salmon candy on top 😉 If you are not sure that the salmon is done, just cut a piece in half and check. You can always stick it back under the broiler but you can’t bring it back to life if you over cook it. 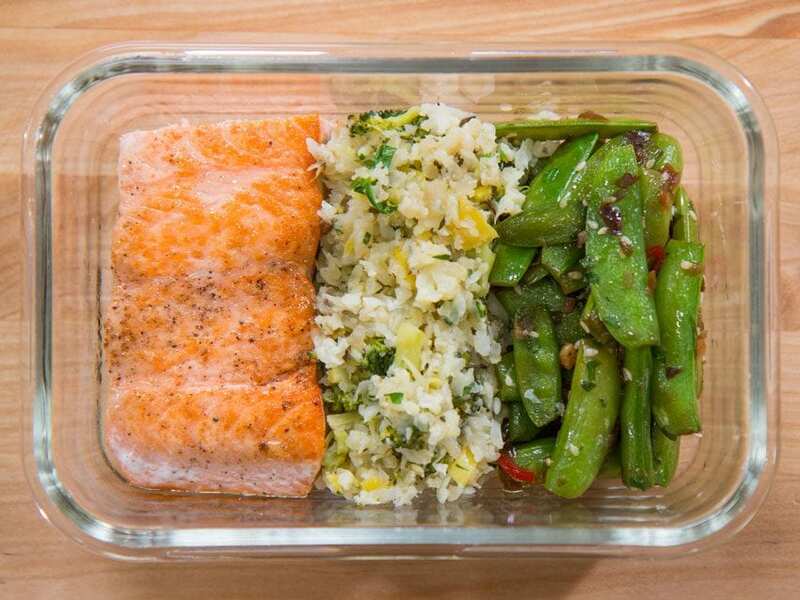 Remember, cooked salmon will only keep in the fridge for 3 days, so plan according for this meal prep recipe for lunch. I wanted to put my spin on a classic deli salad option, so I decided to make roasted cauliflower salad tossed in a tangy mayo dressing with lots of yummy veggies. The key to this recipe is to roast the cauliflower at a high temperature of 450 degrees F. That way it gets nice a roasty on the outside while staying really creamy on the inside. If you think you don’t like cauliflower, try this cooking method and you will be a believer. Toss the roasted cauliflower with peas, carrots, and pickles and then in the creamy mayo dressing. You want the flavor of the dressing to be on the acidic side so it really makes the cauliflower pop. This lunch meal prep is definitely one of my best salmon recipes on the blog. When I recently posted the video on the FlavCity Instagram, people loved it. When you meal prep salmon, keep in mind that it can only last for 3 days in the fridge, so either freeze some or make some more on day 3. 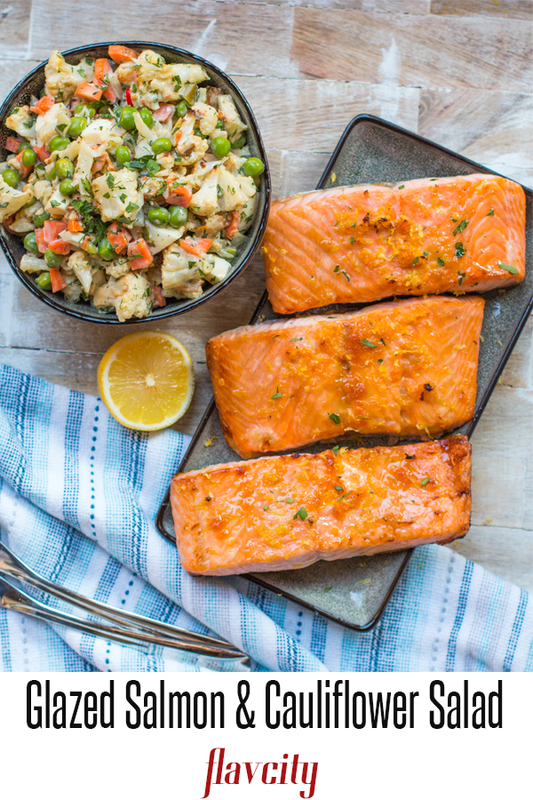 But this salmon recipe is so darn easy to make, you can easily whip up another batch mid-week. This cold lunch meal prep is perfect to bring to work and school. It features citrus and brown sugar glazed salmon with roasted cauliflower salad. Cook’s Notes: Cooked salmon will only keep in the fridge 3 days. So either plan on freezing two of the cooked or raw pieces for a later date. It’s best to buy center cut, thick salmon filets. They won’t dry out like thin pieces tend to do. Season the top of the salmon with the brown sugar, zest, and a nice pinch of salt. Place in the fridge for at least 20 minutes or up to 2 hours. Pre-heat oven to 450 degrees F and chop the cauliflower into large bite size florets. Place the cauliflower on a sheet tray and season with 2 teaspoons oil, just under 1 teaspoon salt, and a few cracks of pepper. Cook in the oven for 25-30 minutes, or until the cauliflower gets well browned. While the cauliflower cooks, bring a medium size pot of water to a boil and cook the eggs. To get beautiful yellow egg yolks turn the heat down to a low simmer as soon as the eggs go in the water and cook for exactly 12 minutes. Keep the water in the pot and place the eggs in a bowl filled with ice water. Gently crack the eggs a little so the water can get between the shell. Let sit in ice water for 5 minutes and then you can easily peel the shell away. Cook the carrots in boiling water for 2-3 minutes with a big pinch of salt. Add the frozen peas and cook for 1 more minute. Drain the veggies and immediately move them to an ice bath for 2 minutes to stop the cooking process. Remove from ice bath and allow to drain. In a large bowl add the chopped eggs, pickles, chile, peas, carrots, and herbs. Once the cauliflower is roasted, carefully add it to the bowl. Make the dressing by combining everything in a small bowl and whisking well. Check for seasoning, you may need more lemon juice as you want the flavor to be nice and tart. Add almost all of the dressing to the salad and mix well, adding more dressing if needed. Taste for seasoning and set aside. To cook the salmon, pre-heat the broiler to high and make sure the oven rack is 8-10 inches away from the broiling element. Remove the salmon from the fridge and place them on a sheet tray lined with tin foil, making sure no excess glaze is on the foil otherwise it will burn and smoke. Broil the salmon for 5 minutes if you want it medium rare, or 7 minutes if you want it medium. 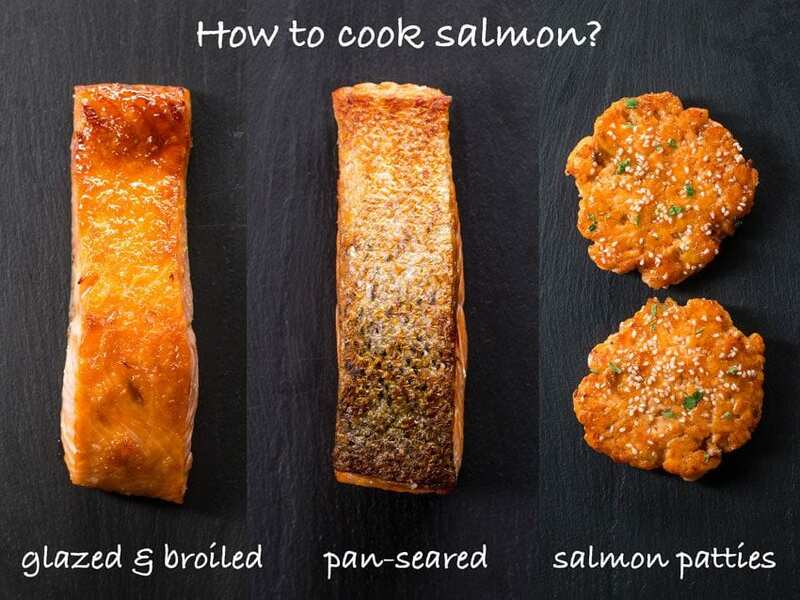 It’s hard to know when salmon is ready, and the last thing you want to do is overcook it, so just cut one piece in half and see if it is done to your liking. Plate the salmon with the salad and enjoy! The cauliflower salad will keep in the fridge for 5 days, but can’t be frozen. The salmon will keep in the fridge for 3 days or can be frozen for 2 months. When re-heating, it’s best to thaw the salmon the night before and re-heat in a 300 degree F oven for roughly 10 minutes. If re-heating in a microwave, cover the dish with a wet paper towel and make sure not dry out the salmon. Thanks for this recipe Bobby! My husband loves it. It’s perfect with this high heat we’re having in California. I love how it only took 1 hour out of my Sunday to prep a work week worth of lunch. What is the serving size for cauliflower salad? The salmon is 5oz but wondering for the salad. I made this yesterday and very delicious! Prepped 5 meals! Keto, day 1! The cauliflower salad should be divided in 5 to accompany the five, 5oz salmon fillets. Glad you enjoyed the recipe! Keep on cookin’!